First I will start with some stamps from the French period.. this 1st series, obligates me to divide my thinking into 3 different steps, for viewers who don't collect French Morocco stamps could have all the information..
B) in 1911 , the same stamps were emitted with Surcharge in Red and Blue..
C) in 1914 the stamps from B) were Overprinted with the label "Protectorat Français" ; these 4 stamps we have here , are part of this C) step. The first two stamps are from the Original France "Blanc" series, named in honor to its designer Paul-Joseph Blanc and the last two from the "Mouchon" series (with the name of the Designer/Engraver Eugéne Mouchon) ; both these series were originally issued in France in 1900 [Blanc (1900/1924) Mouchon (1900/1901)]. So, we have stamps from the series (17) "Overprint 'Protectorat Français' on «Surcharge on ««France 'Blanc','Mouchon' and 'Merser' series (1911/1917)»»» (1914/1921)". [Des] Paul-Joseph Blanc : (b 1846/d 1904) painter and designer of Historic Scenes. Grand Prix de Rome in 1867.. 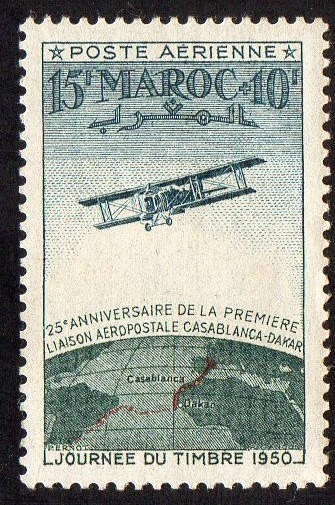 Professor of design in the School of Arts in 1893.
these are 4 beautiful stamps of a Air Mail series (11) "Flight over Casablanca" (1922/1927)" ; the stamp of 80c was issued in 1927 while the others are from 1922. for the enthusiasts of aviation , I can tell that the picture represents a 'Breguet 14T Biplane'..
[Des] Joseph De La Néziere (b 1873/d 1944) French painter.. during his travels through North Africa , he became an Orientalist Artist.. in 1910, was commissioned to illustrate the stamps of the North Africa French Colonies. Died in Casablanca. [Engr] Printing Helio-Vaugirard,SA (b 1897) since 1917 to 1951 the company has specialized itself in stamps , with the commission of works in Morocco, Lebanon,Syria, Madagascar, Vietnam, etc (SAAR protectorate also). 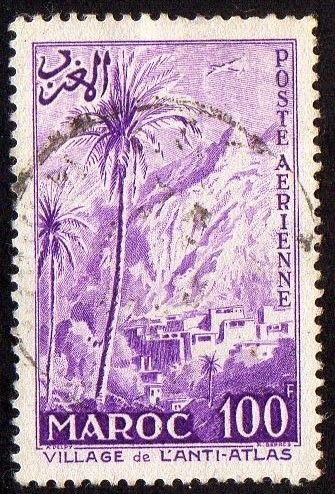 Complete series 1950 "Stamp Day and 25th Anniv of First Mail Flight from Casablanca to Dakar"
from a Air Mail series (3) 1955 ; the picture represents a small village in the Anti-Atlas Region. [Engr] Raoul Serres : (1881/1971) "Grand Prix De Rome 1906" and numerous other Honors during his life ; Book Illustration and Stamp Engraver...60 postage stamps in France and others in North Africa French Colonies. Complete series 1960 "World Refugee Year"
[Des][Engr] Albert Decaris : (1901/1988) Grand Prix de Rome 1919 ; illustration of books, designer and engraver of more then 170 stamps in France and about 400 in North African Countries.. Also make several large formats Art works with 1 meter large.. numerous honors by France and French Postal Authority. 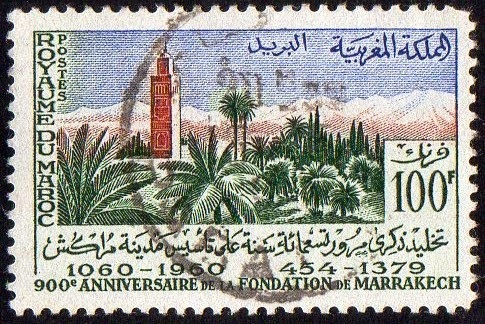 Complete series 1960 "900th Anniv of Marrakesh." [Des][Engr] Charles Mazelin (1882-1984) studied at the decorative arts school in Paris and received the Prix de Rome twice, in 1906 and 1908. He began engraving in the field of philately only in 1939.He worked also in collaboration with other painters in the illustration of numerous books. Mazelin's style is considered to be sober and classic. 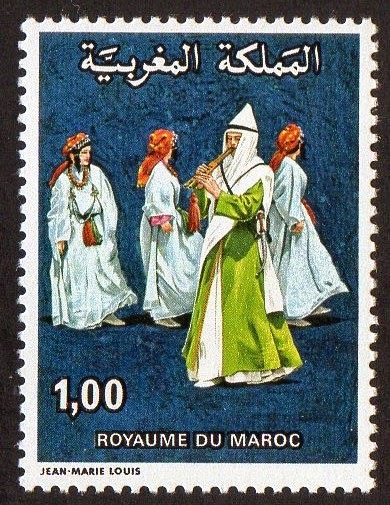 [Left] 1978 "National Folklore Festival, Marrakesh." 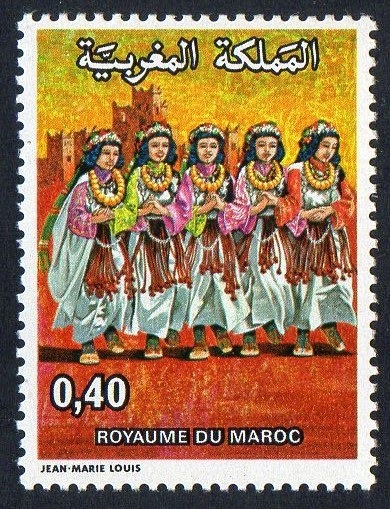 [Right] 1979 "National Folklore Festival, Marrakesh."